Logitech's Harmony remotes are probably the best smart remotes in the business - they're easy to use, quick to set up, and well made. Today the Harmony Smart Control is $60 off on Amazon or Best Buy - 46% off - bringing the price down to $69.99. The Harmony Smart Control means many appliances in your house - cable TV boxes, streaming boxes, televisions, game consoles and a lot more - can be controlled via either the included remote, or your phone provided you download the app from Google Play. This is made possible through the Harmony Hub, which converts RF signals to either Bluetooth or infrared, letting your phone control anything the Harmony system is compatible with - that's over 270,000 devices. 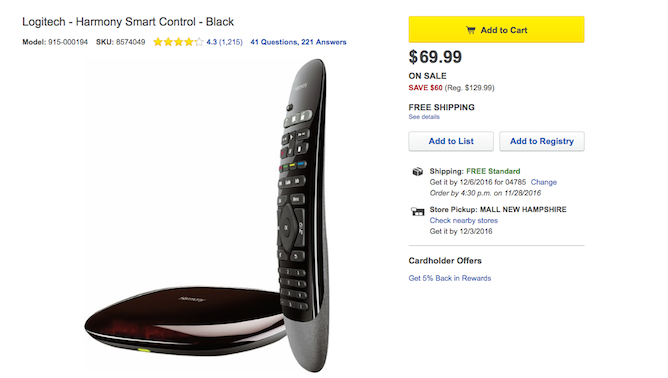 The Harmony Smart Control is available from Amazon now, as well as at Best Buy, so if you're looking at throwing out all the remotes for different things, go grab this one before it's too late.